This practice outlines the results of the project component ‘Spatial demands and scenarios for maritime sectors and marine conservation’; a key component of the SIMCelt Project which investigated current and potential future spatial demands of key maritime sectors within the Celtic seas with reference to cross-border issues. What are the major drivers for change in the Celtic Seas? What sectors are expected to experience growth in the Celtic Seas? What is meant by scenarios and how can they be used in both terrestrial and maritime spatial planning? What approaches can be used when developing scenarios and how can they be utilised in a planning context? 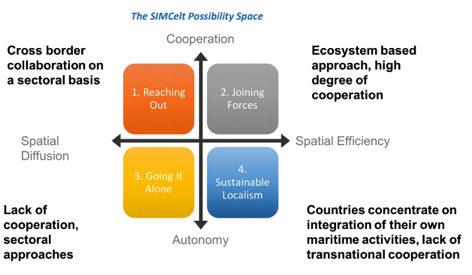 The SIMCelt (Supporting Implementation of Maritime Spatial Planning in the Celtic Seas) Project focused on promoting the development of transnational cooperation to support the implementation of Directive 2014/89/EU in the Celtic Seas. One aspect of the project examined the development of scenarios for MSP. As outlined in the Overview Report on the Current State and Potential Future Spatial Requirements of Key Maritime Activities, the first initial step was examine what is meant by scenarios and how they are used in planning (including MSP). They key lessons that were drawn out from previous studies and other lessons learnt were then applied and used to develop a methodology for scenario building within the Celtic Seas. The sectors which met this criteria were Aquaculture, Cables & Pipelines, Offshore Wind Energy, Ports and Shipping and Wave and Tidal Energy. Following the selection the notes were developed between January 2017 and February 2018 and circulated to a wide audience of stakeholders for feedback ranging from government departments and agencies, industry and private sector organisations, NGOs and academics. In order to develop the SIMCelt scenarios information from the sector briefing notes, feedback from stakeholders, additional material from other reports and articles were brought together to form the basis of a set of maritime scenarios designed to prompt future discussion with regards to future development of different sectors within the Celtic Seas and the effect this have on transnational cooperation. Their implications for transnational cooperation on MSP. These two dimensions or characteristics of future sectoral activities were then used as the basis for the two axes in a possibility space. Along the horizontal axis, changing spatial footprint is measured with spatial effusion vs efficiency. Along the vertical axis, degree of cooperation between administrations were considered examining a highly cooperative scenario vs one where a high degree of autonomy exists between different countries. These dimensions were used to create the SIMCelt possibility space. Following defining the key dimensions of the possibility space each of the four scenarios listed in the diagram above a set of four more detailed storylines were created for each one details descriptions for each can be found in the Overview Report listed below. The impacts on sectoral drivers and planning issues across all the sectors in the Briefing Notes and drawing on drivers identified from the comparative study of Marine Protected Areas, were then mapped on to the possibility space in order to create storylines for each scenario. Each driver/issue in the tables was numbered (e.g.O1, O2 for offshore wind, C1, C2 etc. for conservation and so on). Based on the likely impacts of each driver/issue in the table, it was then decided where this issue would fit within the possibility space. 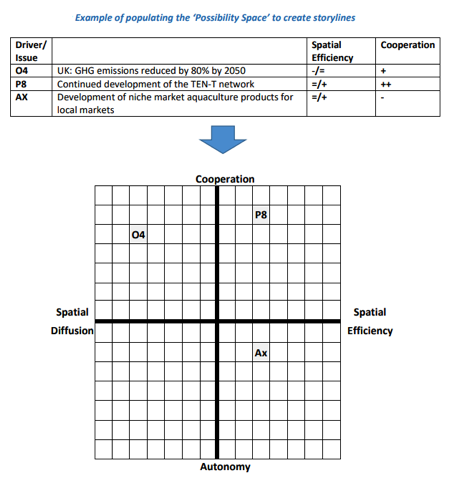 As a guide, where spatial efficiency was seen to be increasing, the marker would fall into either scenarios 2 or 4 (the right-hand side of the matrix), or if it was decreasing in scenario 1 or 3 (the left-hand side of the space). Level of cooperation was then considered – if this was seen to be increasing the marker would fall in the top half of the space (scenarios 1 or 2), and if decreasing in the bottom half (scenarios 3 and 4). The diagram below shows an example of how the ‘Possibility Space’ was populated. Each of the fours scenarios were tested and stakeholder views obtained at a workshop held at the University of Liverpool London campus in September 2017. Participants were divided into four sectoral groups best representing their interests and then contributed to three interactive sessions examining Sectoral Ambitions, Sectoral Interactions and Promoting Cross-Border cooperation. The full results of the Workshop can be found in the Overview report mentioned below. This set of briefing notes provide information on the current status and trends of each sector within the Celtic Seas, associated marine planning policies and the drivers of change that may affect how each sector develops in the future. Finally, a Comparative Analysis of National Strategies for Marine Conservation in the Celtic Seas Region (de Magalhaes et al, 2017) was undertaken. This report provides insights into the governance of Marine Protected Areas (of numerous types) at international, European and national levels and identifies key similarities and differences between management approaches, recognising that different types of protected area can prohibit human activity, but also through an ecosystem-based approach allow for certain types of activity within limits. The approach has been developed in the regional context of the Celtic Seas. However, the developed criteria may also inspire the work in other regional contexts.